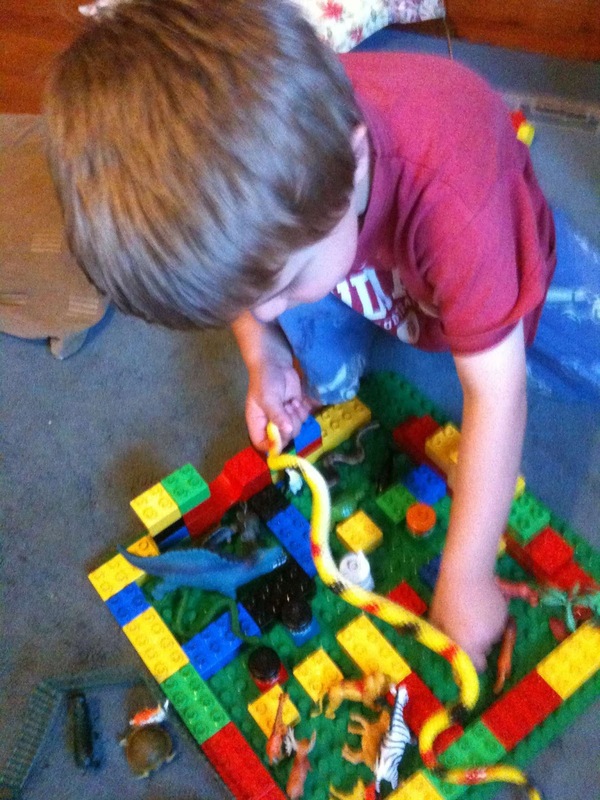 Imaginative recreation is an essential part of learning, probably even life. It sits alongside 'story' as an essential way to relive or enrich narrative experiences. Story in its own right is critical to learning, communication and well-being. Imaginative recreation is one of its essential foundations. For many children, the re-creation of story is a critical part of their growing knowledge of narrative. 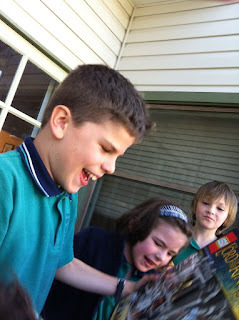 In the photo (left) Jacob receives a Lego set for 'The Lord of the Rings' based on some of his favourite books. His joy comes from knowing he will have hours of fun re-creating his experience of Tolkien's wonderful books. The re-creation of literature is a part of the enjoyment of the story, but it is also a means to deepen our understanding and appreciation of it, as we respond to it in new and varied ways. a) Playing 'Incy Wincy Spider' as a toddler. b) Acting out 'Little Red Riding Hood' with the resources of the dress-up box and some friends. c) Dramatizing a well-known children's song from television or CD or a children's picture book. d) Using art or drawing to imagine a story character, mythical creature or story setting. e) Using Lego (or other toys, props and objects) to re-imagine story alone or with others. As a child I would spend hours alone in the yard using the resources of my Grandad's back yard to invent stories of far away planets, alien peoples, and terrifying battles. Discarded pipes became rocket ships, a steel anvil the foundation of a vast city, wire and tools parts of hideous weapons. Pieces of wood were hammered together as strange vehicles, and weird imaginary creatures were made from anything I could lay my hands on in Grandad's shed. Some of these stories were new creations, while others were the re-creation of known or adapted stories. For Jacob, imaginative recreation has been an essential part of his life and development. As a one year old he would attempt to dramatize parts of stories (e.g. 'Where the Wild Things Are' was a favourite), as a four year old he would act out 'The Wind in the Willows' with family members. 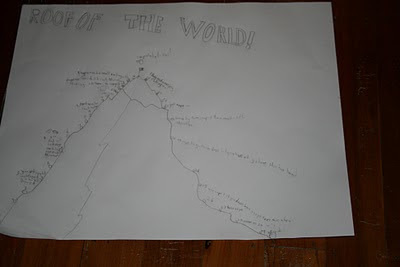 As an eight year old he would draw maps and images of characters. And now, as a ten year old, he re-creates complex story settings, plot elements and story episodes using resources like Lego, drawing, modelling and writing. But why is this important? Is it 'just' play? Play with and understand the complexities of plot development. Comprehend any story at much greater depth. Understand character development in new ways. Enter 'into' a setting as they create an imagined version of the setting and events of a story. Understand story in three dimensions. Appreciate the way the language of story is shaped by, and in turn shapes, characters, settings and plots. In short, imaginative re-creation is a powerful learning strategy for children that stretches them as language users and learners. Being encouraged to be a wild thing as the story 'Where the Wild Things Are' reaches the critical moment when Max declares 'Let the wild rumpus start'. Retelling Thomas the Tank Engine stories using the various engines that feature in the story. Using dolls or soft toys to act out domestic scenarios. Using dress-up clothes in association with well-known stories. 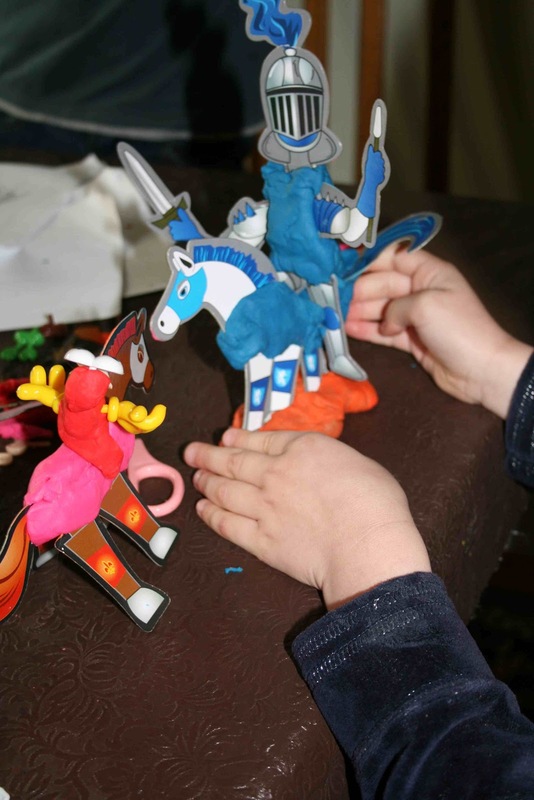 Creating a story using toy soldiers, Polly Pocket toys, magnetic boards with characters, fuzzy felt and so on. Joining in the television dramatization of a well-known story on a program like 'Playschool'. Many of the better story apps for iPad or android devices are an innovative way for multiple re-created experiences of stories (see my recent post on this HERE). Drawing maps, key characters (dragons, people) or scenes. Acting out stories with a group of children or with adult family members. Creating an adapted text to re-create part of a story (e.g. poetry, a character interview, telling the story from a different point of view). Use the strategy I call 'Never-ending Story' to encourage a group of children to invent narrative re-creations together. One starts a re-creation with a single paragraph, folds the paper over and hands it to the next person to do likewise. Continue for a set time. Using puppets to re-create a story. Using modelling clay or craft materials to create characters to re-create and retell a story. More elaborate dramatization, with involvement in making props and costumes. Simple animations using one of the programs readily available (see my previous post on animation HERE). Using materials like Lego to re-imagine a well-known story. 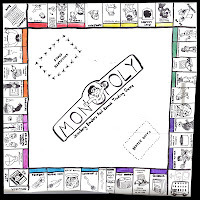 Creating a board game that recreates the plot or a specific part of a story. Creating a complex map or plot summary as a device for others to use. Create a script to be acted for a specific part of a story. Write a newspaper report based on an event within a story. Use a variety of written genres to create a new text ('The Jolly Postman' and 'The Jolly Pocket Postman' are published examples of this). These are just some of the ways that imaginative re-creation can be stimulated. I may do a future post on some worked examples of imaginative re-creation for classroom use. In the May 2011 edition of 'Language Arts' Maria Paula Ghiso wrote an excellent article in which she made a number of important points about children's writing. Her work was based on observations of a Year 1 classroom. In this classroom, the teacher urged her children NOT to just to write for the teacher. Her reason for this is that while she knows that children need to accept the teacher's authority and write because they have been told to, she suggests that this must never be the only reason. Authentic writing should be directed by the author's motivations, not just those of the teacher, or anyone else. 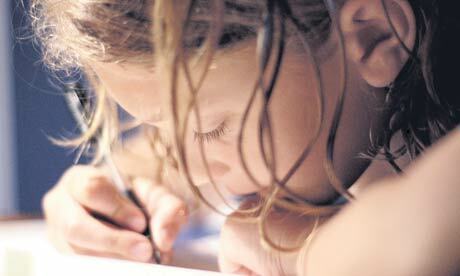 They should demonstrate personal 'voice', passion and commitment to their writing. Many decades ago Donald Graves made this same point in his book 'Writing: Children & Teachers at Work' (1983) as a result of his extensive classroom research. Prior to Graves, James Britton and other English researchers similarly stressed that authentic writing requires a sense of authentic audience; people who want to read the text to find out, be amused, be persuaded and so on. But while the point isn't a new one, it would seem that some classrooms rarely move beyond assigned writing with the teacher as sole audience. Testing regimes and mandated curricula tends to reinforce this, with adverse consequences for children as writers able to produce diverse, interesting and effective writing that has a sense of voice. The use of a workshop format where students were viewed as writers who had a high degree of control of the choices they made. The classroom had a 'critical orientation' with young writers made aware that their writing was socially and historically situated and that it should be about things that 'mattered'. Questions asked of them as writers were not to be seen as a problem but as necessary for inquiry and growth as writers. Writing was modelled not just as the demonstration of proficiencies in skills like spelling, but first and foremost as something 'making sense and worth doing' because it conveys 'ideas that matter'. While there are many implications from Ghiso's small study, a key point is that it reminds us that authentic writing is important. Children need to be challenged to write things that matter to them, not just what they think the teacher wants. This reminds me of a young African American student who I met while teaching a grade 6 in the USA. I team taught on this class for six months and met Chanda the first day. She was a likeable confident young 12 year-old, but when we had writing she did nothing. Many weeks went by with Chanda showing constant resistance to any attempt to get her writing. But one day there was a breakthrough. Just before school commenced I noticed that she was writing something. 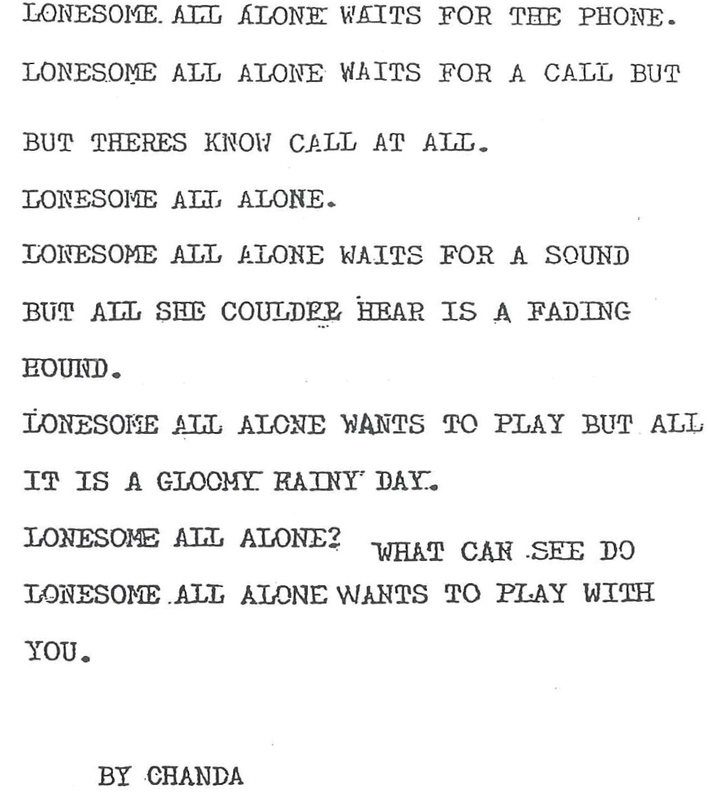 I asked her what it was and after some coaxing she showed me a folder of songs, a personal folio of music. 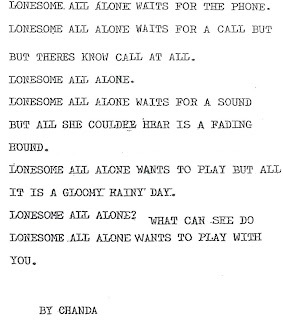 When I read some of the music I was amazed to see that this 'non-writer' was writing meaningful lyrics that had promise. For Chanda the music mattered but the school writing didn't. a) Provide time - young writers need time to explore ideas, talk to other writers, note good writing topics, talk to other writers, conference with their teacher, revise their work. b) Help writers to assume greater control over their writing topics - while teachers should assign some writing, children need to be able to pursue their own interests and be encouraged as they explore new ideas. c) Provide readers who know how to respond in helpful ways - one of the tasks of any teacher of writing is to develop an environment in which children know how to respond to each other's writing. The teacher will model this but will also give explicit instruction and guidance. Ghiso provides some lovely examples of how the teacher in the classroom she observed modelled this. d) Give writers help to learn the craft of writing - like a painter, potter or singer, the young writer needs to learn about the writer's craft including grammar and spelling, but also how texts are structured (genre, register etc), where to go to find help, how to find inspiration, how to research a topic etc. e) Ensure that writers see good writing demonstrated - they need to read good writing (e.g. literature), hear good writing read, watch good writers involved in the craft, be involved in joint construction of writing, see writers revising their work, hear writers talking about their writing and how they do it. f) Make sure that writers have interested readers - all writers need people who will read their work, offer praise, simply respond to the content, and at times offer constructive criticism. This is a wonderful story app that is based on the delightful picture book written by Helen Stratton-Would (author) and illustrated by Vlad Gerasimov's, 'Who Stole the Moon' (2010). It is exciting to see a good book turned into an eBook with interactive elements that add value to the reading experience. It tells the story of Bertie who has a top-floor attic room and a skylight that lets him stare at the moon and stars. But one night, he realizes for the first time, that he can't see them any more. Bertie sets out to solve the mystery and in the process learns more about the way his world, the moon and stars 'work'. The app uses a number of simple yet complementary interactive elements that expand the child's experience of the book and add to the reader's understanding of what happens with the movement of the moon's phases and clouds. My favourite element is the ability on one page to move the clouds to show how and why the moon at times will disappear. The reader in the 'read to me' option is also excellent. The app also incorporates eight original songs that complement the bedtime reading experience of sharing this book with your child, and game elements that I could do without. But at least you can choose to use the games or leave them alone, and it's easy to get back to the story. The story is simple and the language is used well to communicate a simple story that children will love. It is available in multiple languages and is a story that transcends cultural boundaries, teaching about the world, while offering a great shared book experience. The illustrations are wonderful, with simple lines and deep rich colours with the feel of a watercolour wash. The app is suitable to share with children aged 0-6 and for beginning readers to read alone. You might note however, that there are buttons on the front page that link to Facebook and Twitter, which I'd encourage the developers to remove. 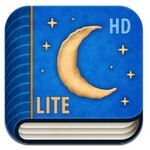 This review is based on the FREE Lite version. A full version is also available. It's the best free story app I can recall. I highly recommend this app and give it a rating of 9/10. 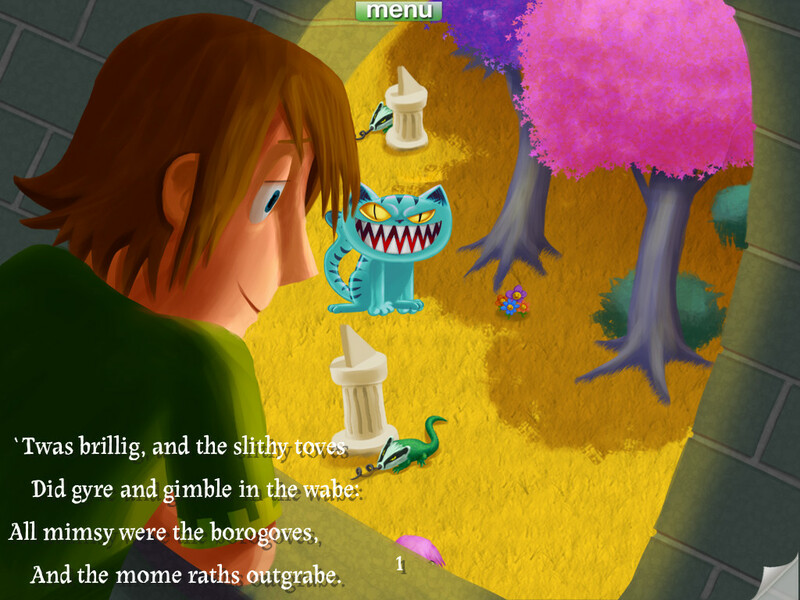 This app is based on the Lewis Carroll poem 'Jabberwocky' that appears in 'Through the Looking-Glass and What Alice Found There' (1871). This 'nonsense' poem is considered one of the finest children's poems of all time. The app is illustrated by Matthew Vimislik and presented either by two readers (male and female) or in 'read it yourself' mode. It also has provision for the child to record their own reading. The interactive devices used are simple and are primarily touch and watch features, where objects move, respond, make noises etc. While this doesn't add much to the reading experience they are not too distracting. The illustrations are bright and engaging and complement the text, and the key illustrated characters often react and speak when tapped. For a poem that is difficult for today's child reader, the illustrations help the reader engage and follow the narrative within the verse. There are a few other features that children will enjoy, but don't add much value. For example, the reader can turn the screen and touch it to reveal the Cheshire Cat on each page. While the app has just 8 pages, it is a complex poem that will intrigue children, especially if they like language and enjoy rhyme and nonsense verse. 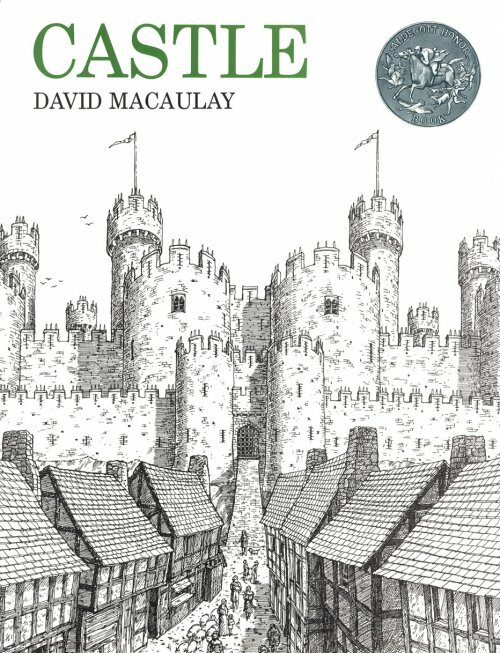 Recommended for readers aged 6-10. I've given it a rating of 7/10. This is a delightful FREE story app in which the reader has a key role in deciding on the main character, the nature of the story and the ending. There are numerous options that feature three youngsters (a bear, a raccoon and a bird) who are told stories by the storyteller, Granny Olive who at the commencement of each tale asks for volunteers to shape the story. The stories are short (about 2 minutes) and are told delightfully by Granny Olive. 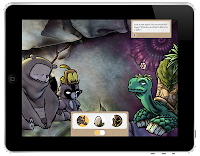 The app is brilliant for teaching story structure, character development and how to engage the reader. In many ways, this is a writing app as much as it is a reading app. Children aged 3-7 will have lots of fun with the app. The app has really only one mode, 'read to' and is on auto play once the story choices have been made by the 'reader', but it does present the text so that children who can read may follow. The text is presented in a type of cursive script that won't be easy to read for younger readers. 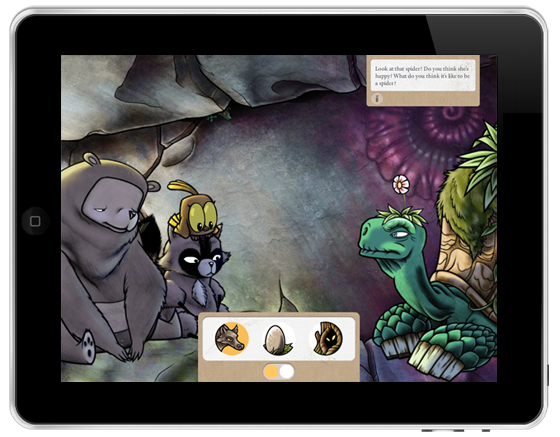 This is not your typical story app, something I like, and it will appeal to children. While I have reviewed the free version there is a full version of the app with many additional features. The app has been nominated for the British Film and Television Awards (BAFTA) in the 'Fun and games' section. Highly recommended for children. I've given this free version a rating of 8/10. 'Franklin Frog' is a beautiful ePicture book based on the story written and illustrated by Barry and Emma Tranter. It kept me smiling with delight from beginning to end. Franklin is a frog doing what frogs do, hunting and eating dragon flies, jumping around, swimming, eating snails and worms, flies and so on. 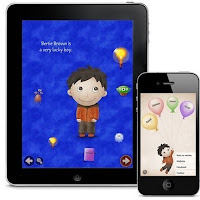 But the exciting part of this app is that it 'invites' the reader to join Franklin in his daily activities, touching him to make him speak, helping him to jump, swim and catch his food. 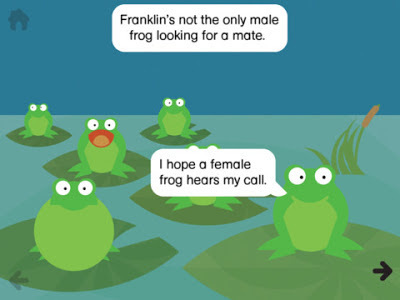 It also engages the reader in an understanding of the complete life cycle of the frog as Franklin finds a mate, eggs are laid and eventually tadpoles born. This is another fine example of an app that engages the reader in new ways and invites a level of participation in the story not possible without the app. And it does this without compromising the beauty and delight of the text and the illustrations. As well, it teaches the young reader about the life cycle of the frog. The app works as you'd expect with simple page swipes, text highlighting that is switched off by default, but can be turned on, and delightful child readers. This is one of the best story apps I've seen this year. I highly recommend it and give it a rating of 10/10. 'Magnus the Magnetic Dog' is a quirky story written and illustrated by Julian Damy. It was actually developed by the author using the program Demibooks Composer. 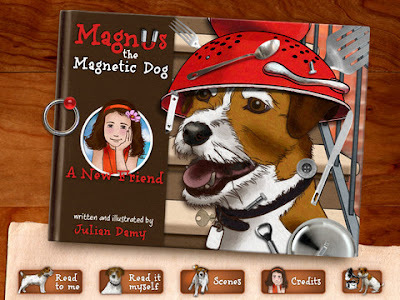 It tells the story of Magnus the dog who is afraid of storms. He climbs to the top of his building to face his fears, but is struck by lightning, falls and lands on top of a truck. When he finally wakes up he has a strange new quality, he is magnetic! He meets a girl named Olivia and they work out the source of the mystery together. The animation's use of music and subtle interactive elements, work together beautifully to create an excellent reading experience. It is a delightful story that is well written and the pen and wash illustrations are perfect for this story about a lovable terrier. One excellent feature is the addition of extra scientific information and safety warnings that offer new knowledge for the young reader. Each instance is found by tapping a small image of Magnus below the story text. The book also ends with information on how to make your own electromagnet. One thing I didn't like was the text font used, that was a form of cursive, and was very small. A text highlight feature might also have been helpful for younger readers. Highly recommended. I have given it a rating of 8/10. This is a remarkable story app. It tells the story of a cat with ambition! Babel always wanted to reach the clouds, but he could never quite make it, so he decides to annoy them! But one day the pesky cat is struck by lightning and experiences a great wind which sweeps him up before a great 'fall'. This leads him to reconsider his life, but his ambition only grows. The self-declared 'King Babel' with a crown (that is really a cage with a sly bird within) upon his head, proceeds on a risky path at the urging of the sly bird. This leads to the gathering of some loyal subjects and the building of a great castle. The story has many biblical echoes including the story of the Tower of Babel and Genesis, that speak of human ambition in the face of God, but for many readers these themes won't be obvious. The text is well written and engaging and the illustrations and animation stunning. The words, images, sound and music and subtle interactive elements, work beautifully together to offer the reader or listener a coherent experience of a truly multimodal text. The app thankfully has few features to distract from the story. It does have an annoying 'help layer' (dotted lines over images), to encourage the reader or listener to tap the images, but this can be switched off allowing children to enjoy and interact with the app without this distraction. Some of the interactive elements are clever, such as the ability to blow on the screen and move things around, and many images can be shoved or moved about, made to spin and so on. One thing it lacks is a highlighting feature for the text. I'd suggest the developers add this, preferably with phrases, not just single words. As well, I found the page turning using arrows at the top middle of the screen to be 'clunky', a simple swipe would be much better. One final addition that would help sales would be languages other than just English and French. In spite of the final comments this is a brilliant app that I highly recommend. I have given it a rating of 9/10. 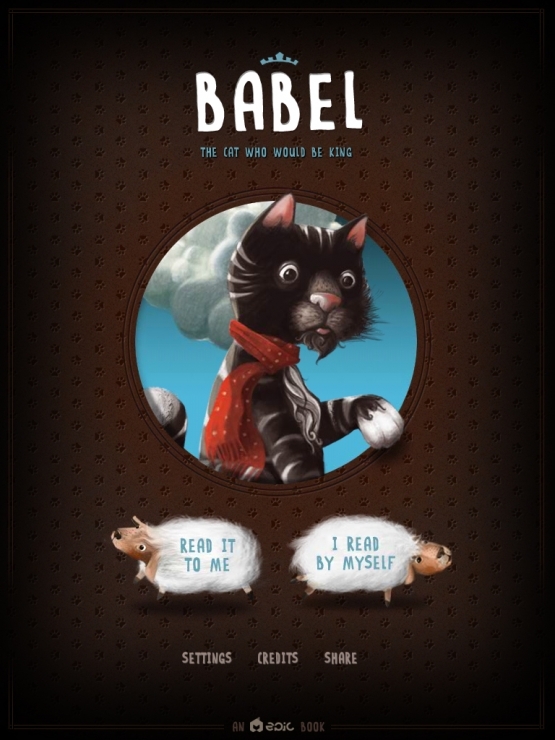 This app is based on the well-known picture book of the same name developed by acclaimed writer and illustrator Graeme Base. This is the classic children's early counting book, but Graeme Base's books are always anything but simple. The book uses animals gathered around a waterhole to play with number and rhyme. As with all Graeme Base books the images are filled with fascinating detail, vivid colours, complex hidden detail and rich vocabulary. The app comes with a simple 'read to me' option with Graeme doing the reading. As well, the app includes a matching memory game, a hidden animal search and game a game of leapfrog that requires logic to solve (and won't be solved by many young children). I've said many times that add on activities of this type in my view trivialize the story, but in this case it's the author who is doing it, so who can argue with him. I would have preferred more attention to the complexity of the interactive elements that as they are don't add much to the reading experience. 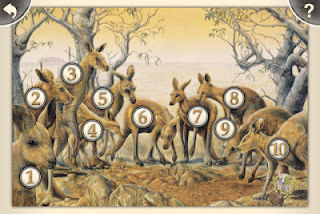 The main element requires readers simply to touch the animals on each page, allowing a simple count to me made. This might be helpful for very young readers. Curiously, the app doesn't have a 'read it yourself' option. The app also appears to have a programming glitch or two with my version stopping to 'load' several times, and once or twice my tapping of the screen led to a prompt to 'copy' the screen shot. This needs to be sorted out. Overall, the weaknesses in the app are partially counteracted by the quality of the book and the illustrations, but to be honest, it doesn't represent for me a significant enhancement of the reading experience. I give it a rating of 6/10 based mainly on the brilliant quality of the original book. 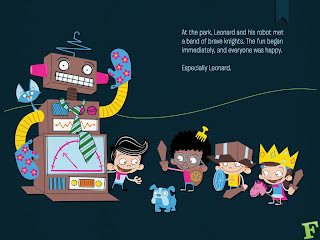 'Leonard' is a simple but engaging story about a little boy who has no friends. He tries everything to make some without success, and so he decides to make his own robot friend with an unexpected outcome. Leonard is a boy with a big imagination, who uses it for a great outcome. The app itself builds on this and in surprising ways engages the reader in exploring imaginative elements through the use of a small lever that appears on most of the 18 pages. This allows readers to slide the button to advance the story and see magical new scenes appear. 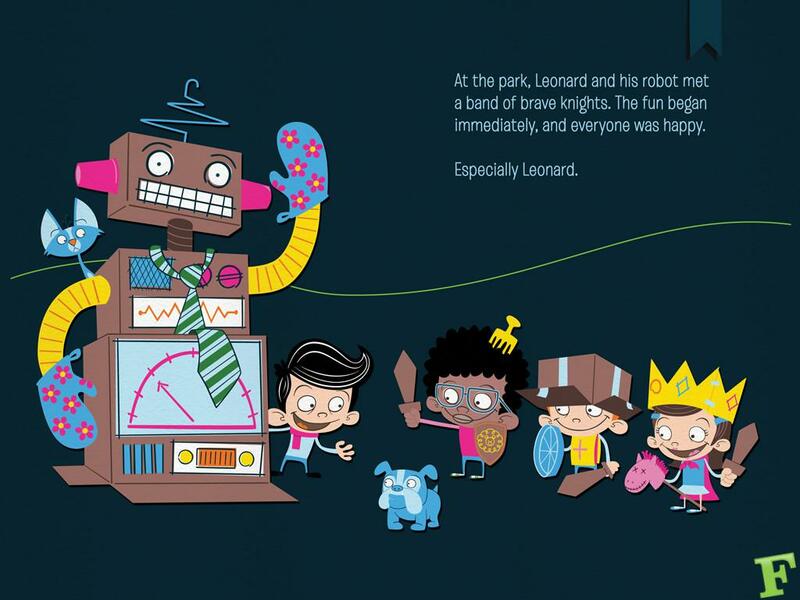 The lever is a prompt to readers to slide it either to progress the story or to create a special effect linked in some way to Leonard's imagination. As Leonard (and sometimes his cat) appears in the scenes, we see what he is imagining. Leonard becomes a lion tamer, a deep-sea diver, he finds himself on safari, in a cafe in Paris and so on. Each of these is linked to the story in some way. The app is very easy to use, and requires no distracting and awkward prompts or instructions. 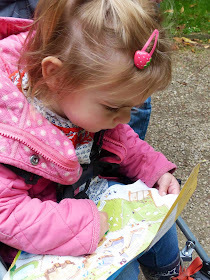 Children can find their way around the app in a few screen shots. The app works well in both 'read it myself' and 'read it to me' modes, uses clear text fonts, delightful simple illustrations, a clear reader and simple interactive elements that contribute to the reader's experience of the story. I highly recommend this app and have given it a rating of 9/10. 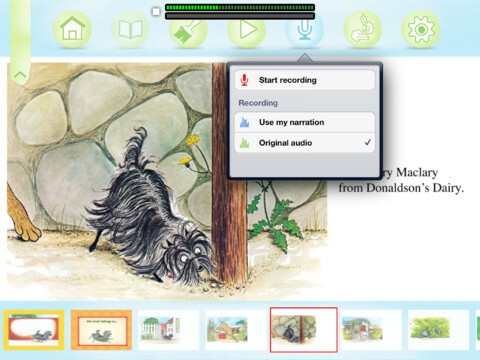 This story app is based on the well-known book of the same title written and illustrated by New Zealand author and illustrator Lynley Dodd. The book of course was followed by the many other delightful adventures of Hairy Maclary, so we can expect lots of follow-up story apps. When developers get hold of great picture books I always hope that they don't mess up something that was brilliant in the paper version. I'm pleased to say that they haven't on this occasion. They manage to keep the app simple, use a great reader, simple elements and the main gadget, the ability to colour the illustrations, isn't a great distraction (you can't see it in the 'read to me' mode). Even this element might just encourage some children to re-read the story multiple times. There is good use of sound, text highlighting in 'read to me' option, which I'd prefer to be phrase-based rather than word-based. There is also the ability to record your own version of the reading. The latter also includes the ability to record it in AUSLAN sign language. The pages are easy to turn with a swipe, and it also has the option to touch the words to hear the word read for beginning readers who are stuck on a word. Yiu can also double tap to have it spell the word (I'm not sure we need the latter). The story introduces us to the cute little terrier with the appropriate name Hairy Maclary and his many friends. This wonderful story is filled with repetition, beautiful use of rhyme, rhythm and verse to great effect. The characters have names like 'Scarface Claw', 'Bitzer Maloney' and 'Schnitzel von Krumm' and lively illustrations to match. This simple story comes alive in the hands of just about any reader, but David Tennant as the default reader is brilliant, and his 'mild' Scottish accent is perfect for the book. All in all, the eBook version of this wonderful book works well. I recommend it and give it a rating of 7/10. Oceanhouse Media has been producing the Dr Seuss book apps for some time, and I have reviewed some of these titles in previous posts. A new way to organize these apps is by using their new Dr Seuss Bookshelf. This is a free app which effectively locates all your Dr Seuss books in the one place and allows you to the go-to app for Dr Seuss books, and games available as a FREE download in the App Store location. 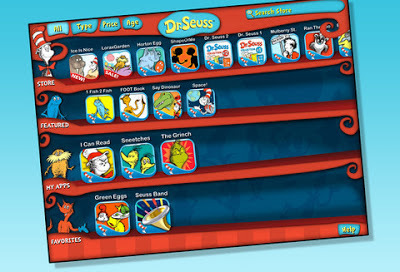 This app lets users organize, launch and browse their favourite Dr Seuss apps on the iPad, iPhone and iPod touch. I would predict that other developers will follow suit with this type of organizational app. While this is also a great way for Oceanhouse Media to promote titles that you haven't yet purchased, it is a convenient way to store your apps. The app allows you to sort by type, price or age, and use the search feature to find a specific app. In addition, the bookshelf app provides up-to-date information on new Dr Seuss releases, sales and suggestions for holidays and special occasions. I could do without the promotion, but others might like it. Of course if you're the type of person who organises your apps into folders already, then you might not find this app of much use. I would suggest that people who have too many apps to organise them into folders might find the app helpful (but you'll need to avoid the product 'push'). I give it a rating of 6/10. Cross section books have been around for some time, but there is no doubt that the illustrative masters of this genre for children are Stephen Biesty and David Macauley. Biesty has worked as a freelance illustrator since 1985, creating information books for adults and children. He lives in a small Somerset village with his wife and son. His first major success came in the 1990s with his best-selling 'Incredible Cross-Sections' (published by Dorling Kindersley). This book has sold over 3.5 million copies and has been published in 16 languages. He has won a number of awards for his work including the 'The New York Times Best Illustrated Book Award' in 1993, and 'The UK Literacy Association Children's Book Award' in 2004 and again in 2012 for his latest book 'Into the Unknown'. 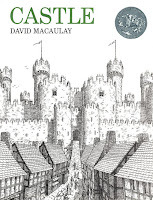 Another wonderful exponent of this genre is David Macaulay. His books include 'The Way Things Work', 'Castle' and 'The Way We Work', are other excellent examples in this genre. He is a British-born American author and illustrator. Now a resident of Norwich, Vermont, United States, he was educated at the Rhode Island School of Design. His numerous awards include the Caldecott Medal, won for his book 'Black and White' in 1991, the Boston Globe-Horn Book Award for 'The Way Things Work' in 1989, and the MacArthur Fellows Program award in 2006. Why do children love these books? I want to illustrate why these books work using Stephen Biesty's most recent book 'Into the Unknown' (2011). The text was written by Stewart Ross and was published by Walker Books. It is one of my favourite books of this type. The book is a wonderful collection of stories and cross sections of 14 'Amazing Journeys'. 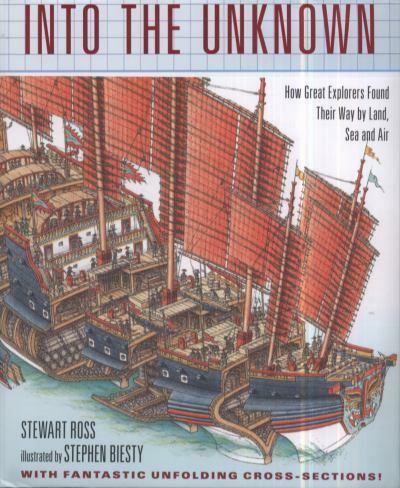 The journeys include the epic travels of Marco Polo down the Silk Road to China in 1271-1274, David Livingstone exploring the Zambesi in 1858-1864, Captain Cook mapping Australia and the Pacific in 1768-1771, Umberto Nobile flying over the North Pole in 1928, Jacques Piccard's travels to the top of the Stratosphere by balloon in 1932 and then by submarine to a depth of almost 11,000 metres in the ocean in 1960. It is suited to boys (and some girls) aged 7-14 years. 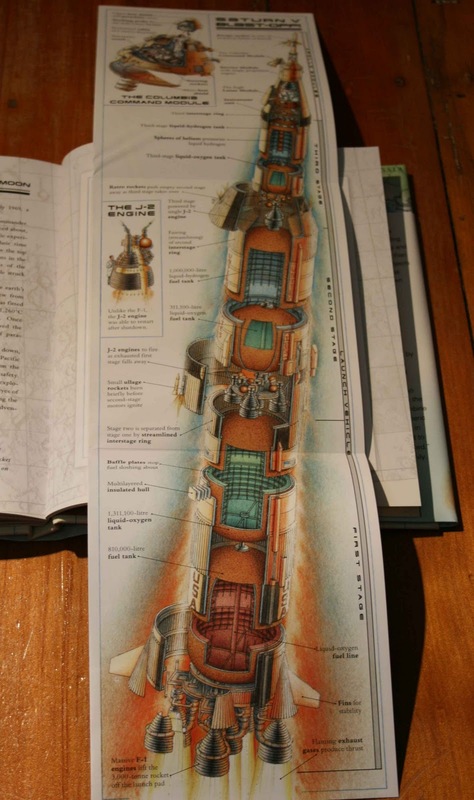 As a child I loved books with cross-sections, maps and detailed diagrams or drawings - bodies, buildings, vehicles, the Earths' crust, mummies and so on. Cross sections teach you things - A cross section of a mountaineer's clothing and equipment offers an immediate sense that climbing Mount Everest must be VERY cold, heightening the sense of this amazing achievement. Seeing Biesty's drawings of Sir Edmund Hillary and Tenzing Norgay on their first ascent of Mount Everest in 1953 helps to make concrete the reality of their experience. Cross sections and diagrams offer a better sense of size, quantity and significance - You can read about the famous crossing of the Indian Ocean by Chinese Admiral Zheng He in 1405-1407, but understanding the shear scale of his 'Treasure Fleet' becomes a jaw dropper when Biesty's fold out drawing of the largest fleet ever sailed by a single commander is revealed. 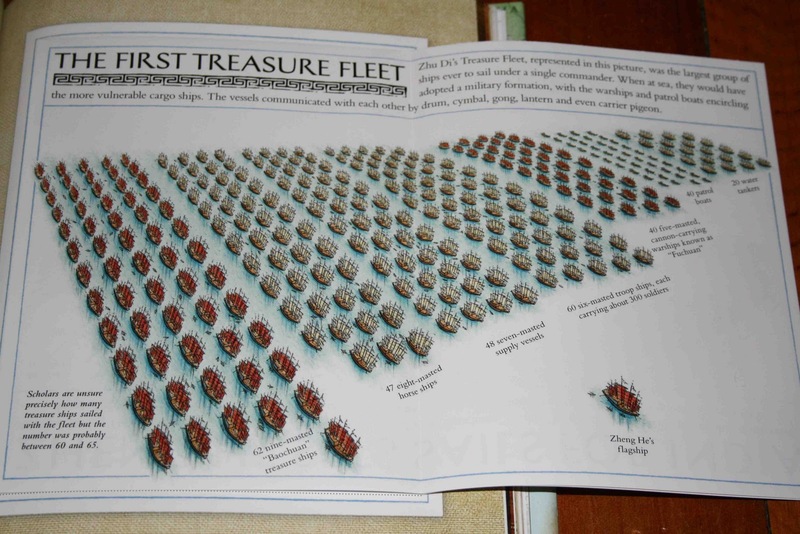 Seeing 62 nine-masted treasure ships, 47 eight-masted horse ships, 48 seven-masted supply ships, 60 five-masted cannon carrying warships, 40 patrol boats and 20 water tankers helps you to visualize the shear scale and wonder of this phenomenon. Cross sections stir the imagination - They encourage children to come up with their own ideas and to represent the learning that has been stimulated in new ways. 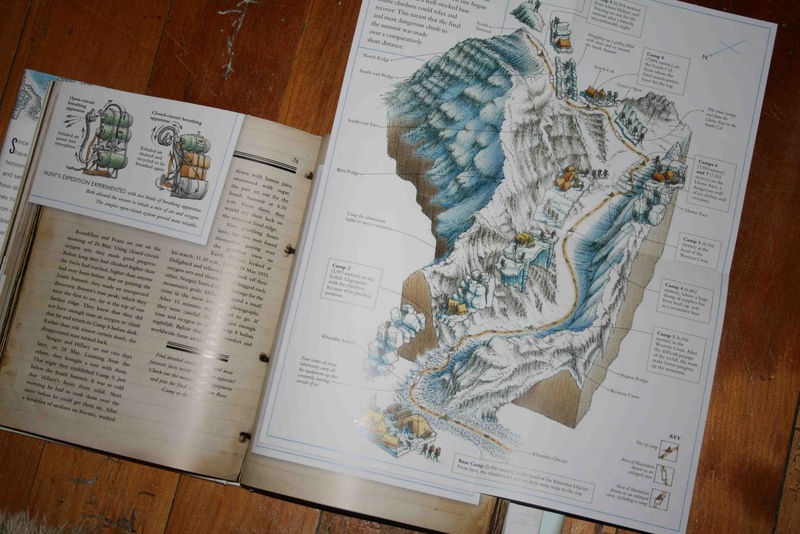 After reading this book with one of my grandchildren aged nine, he raced off to find some cardboard to make up his own board game of the Hillary & Norgay ascent of Everest. 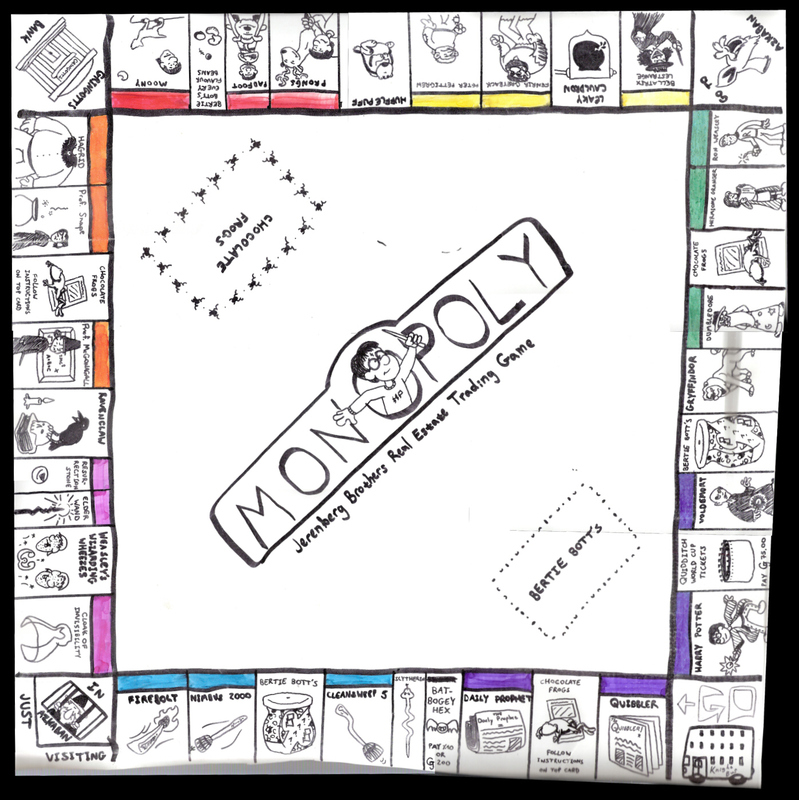 We then had to play it and 'relive' the journey through the game. It had many novel elements. For example, if you failed to land on the spot where you received a critical rope, you were doomed not to make the descent safely. Spontaneous child-initiated activities of this type enrich the experience of the book, stimulate the imagination and reinforce learning. 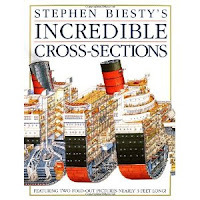 Cross section books encourage boys (in particular) to revisit - A good cross section book will be looked at time and time again, and each time it will fire the imagination and increase the desire to learn once again. Even at my age, I never tire of revisiting diagrammatic representations of Apollo 11 and the first moon landing. The experience of growing up during the space race and seeing the Apollo 11 landing live on television, was one of life's great memories, and it floods back with new richness with Biesty's images. 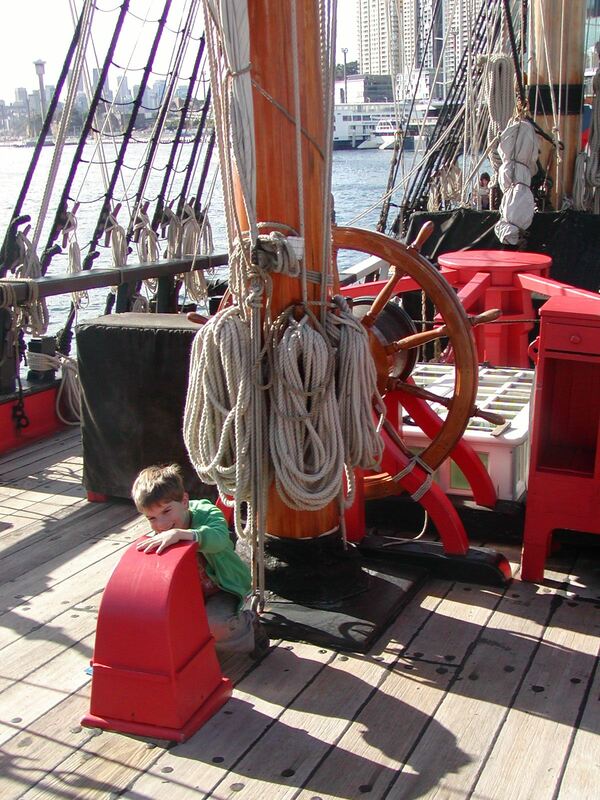 Cross section books also help you to enrich and enliven previous learning & experience - My grandson and I had the chance to see and crawl through an exact replica of Captain Cook's famous ship the 'Endeavour' when he was six. As we looked at Biesty's cross section of the book yesterday we recalled where we had climbed, how low the roof had been and speculated about the exact location of the Captain's cabin. Books that incorporate diagrams, cross-sections and maps have special interest for boys as readers and learners. They encourage them to read and use visual material to reinforce and enrich learning as well as stimulating their imagination and creativity. Short video introduction to David Macaulay's work and the process he goes through to produce his works. 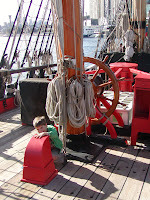 You might also like to read my previous post 'Making Reading Exciting for Boys'.